The American Idol final 2 are....the looks and the voice. Sorry Joshua, it's bag packing time. Of the top 3 Phillip had the most mediocre voice, but he had the best name and the boyish good looks. Joshua had a good voice, but Jessica Sanchez has arguably the best one of the season. After last night's performances it was anyones game. I am not surprised that Joshua got sent packing, but I do think that he ripped the stage to shreds when he did Mary J Blige's No More Drama. I think America may have been thinking the same thing as me when it came to young Josher...your voice is dope, but I don't know that I would listen to anything new you would sing. 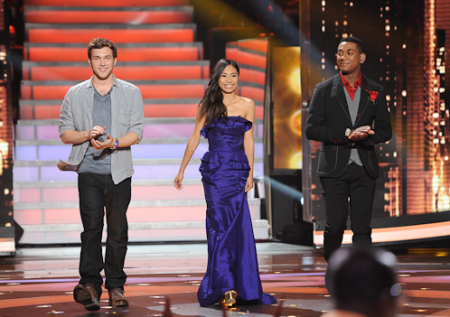 So next week American Idol wraps up...will it be Jessica Sanchez or Phillip Phillips?